Takuma Sato says the fact that he and Graham Rahal swept the front row at Barber Motorsports Park for Rahal Letterman Lanigan Racing-Honda is a tribute to the team – on a peculiar weekend for engineers and drivers. All IndyCar teams had their predictions and planned setups at Barber thrown off by tire behavior yesterday, when Firestone brought a batch of the red-sidewalled alternate compound tires left over from last year’s Honda Indy Grand Prix of Alabama. 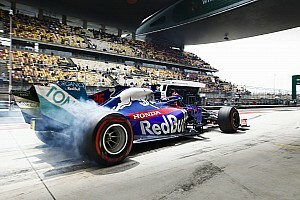 The tires' aging in the intervening 12 months affected the rubber enough that it threw off the cars' balance – most drivers complained of terminal understeer problems – and in second practice, when teams get to try the reds for the only time before qualifying, they were notably slower than on the harder primary compound. 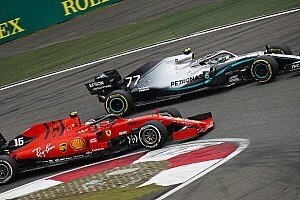 Thus when teams started qualifying this afternoon, they had never run on the fresher (2019-constructed) ‘reds’ and were having to predict car behavior based on their primary tire performance from FP3. 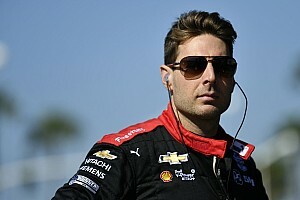 This directly and indirectly led to Team Penske failing to send any driver through to the Firestone Fast Six for the first time since Long Beach in 2014, while Rahal Letterman Lanigan Racing scored its first front-row sweep since Danica Patrick and Buddy Rice qualified first and second at Chicagoland in 2005. 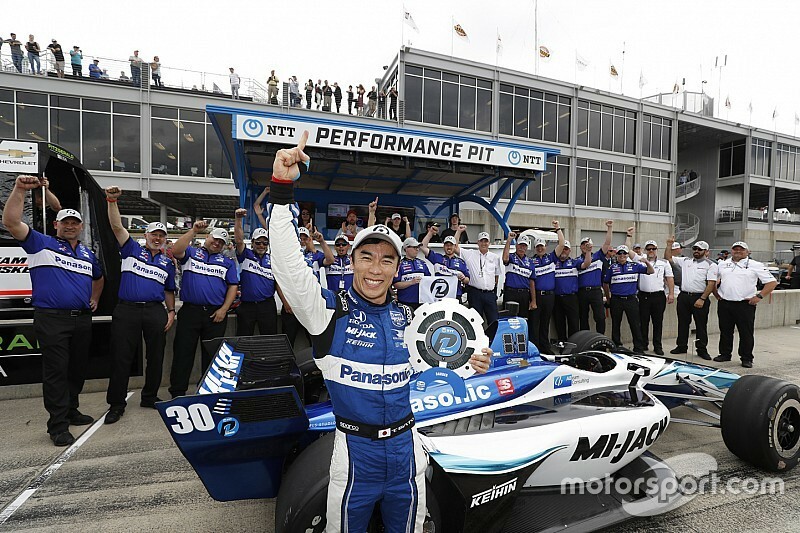 Sato, who took the eighth pole of his IndyCar career but his first for RLLR and first since 2017, remarked: “I'm extremely happy. I've done it a few times on street courses, but this is the first time on a road course. Such a nice feeling. “As a driver, as a team, top of the timesheet, is special. First time in road course qualification, the pole. Front row locked in the team; this is a dream result. “Like everybody said, incredibly tight field. 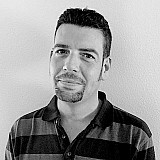 Today I think the team got everything together, so I feel really good. Obviously, tomorrow is a completely different scenario. A lot of big teams coming, chasing. It's going to be challenging. Sato, who raced for RLLR in 2012 and infamously dueled for Indy 500 glory, praised team co-owner Bobby Rahal’s determination and also referred back to the squad’s remarkable giant-killing performance in 2015 when Graham Rahal finished fifth in the championship despite RLLR being only a one-car team. “Bobby's determination never stops, I knew that – obviously 2012,” said Sato, who won for RLLR at Portland last September in an otherwise disappointing season. “Since then, Graham obviously did an absolutely amazing job in the road courses, a couple of years ago, a one-car team – always come back very, very strong. So, the team has been there. The team never showed the ultimate speed in qualifying. “I think the engineers work so hard. Of course, everybody is working so hard in every team. We are trying to find what was the actual problem because last year was huge trouble. Here we are. I think today with a bit of luck; the conditions were liking us. 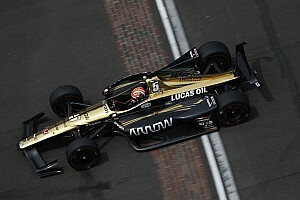 Graham Rahal, who fell only 0.1037sec short of beating Sato to pole, said that he was highly encouraged to be so prominent on the grid at a track that hasn’t always been kind to him in qualifying – especially after ending third practice in the gravel. “Typically, I think the guys did a tremendous job today,” he said. “This morning, our time and our finishing position, which ended up in the gravel, is not indicative of our pace, and we felt that. Did we feel we had the front row locked out? Probably not. “But the really good sign, I think, is that our cars are clearly pretty consistent with tire wear from first run to second run on those reds. I'm excited. I think we're in a good position as we go forward. Bobby Rahal added: “I'm lucky that my partners, Mike Lanigan, David Letterman, have as strong a passion as I do for this sport. “We do whatever we can to ensure that we give our guys the tools they need to be up front all the time. Clearly today there's a great sense of satisfaction, but there's also a great sense of expectation that we should be up here every race. “We've made the commitment to the team to give them the tools and the resources they need to do that, to give Takuma and Graham. You can see what happens when we give them the cars. We give them the cars; they're going to be up front.